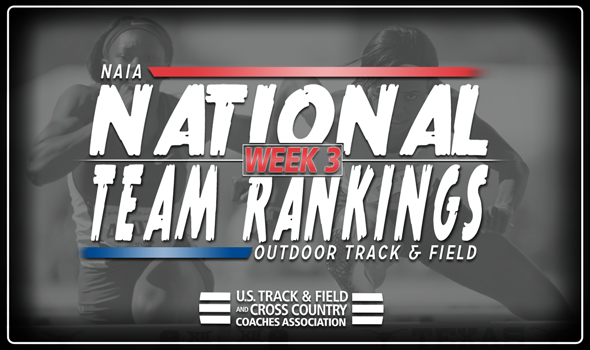 NEW ORLEANS – The winds of change swept through the NAIA Outdoor Track & Field National Team Rankings in Week 3 as 19 men’s teams and 19 women’s teams moved spots between Week 2 and Week 3. Perhaps the biggest alteration in the most recent rankings released Wednesday by the U.S. Track & Field and Cross Country Coaches Association (USTFCCCA) is that Wiley (Texas) took over the No. 1 spot in the men’s index. Wiley (Texas) leapfrogged Indiana Tech for the No. 1 spot this week. This is the first time the Wildcats have been ranked No. 1 in program history. Wiley (Texas) owns four national-leading marks, which include Oraine Palmer in the 100, Rajay Hamilton in the 400, Marbeq Edgar in the 800 and the 4×400 relay team. The Warriors slipped to No. 2, the first time they’ve been there since Week 1 of 2017. Indiana Tech only has one national-leading mark in the guise of the 4×100 relay team. Westmont (Calif.) remains No. 3 for the second week in a row, while Doane (Neb.) and Central Christian (Kan.) both move up one spot from No. 5 to No. 4 and No. 6 to No. 5. Three teams joined the top-25: Wayland Baptist (Texas) went from No. 31 to No. 13, Eastern Oregon went from No. 33 to No. 19 and St. Francis (Ill.) from No. 29 to No. 22. A familiar face is chasing down Indiana Tech. Wayland Baptist (Texas) surged four spots between Week 2 and Week 3 and is No. 2 behind the Warriors at the moment. The Pioneers received two nation-leading marks this past weekend from both Devin Johnson in the 200 and the 4×100 relay team. WBU also has the top-ranked 4×800 relay team and the top-ranked triple jumper in the nation. Hastings (Neb.) and Southern-New Orleans (La.) come in at No. 3 and No. 4. The Broncos got a huge mark from Sara Olsen in the hammer throw as she is now ranked No. 2 nationally in that event at 54.17m (177-8). Friends (Kan.) rounds out the top-5 for the second week in a row. Two new teams joined the top-25: Grand View (Iowa) went from No. 26 to No. 15 and Carroll (Mont.) soared from No. 61 to No. 22.